Jindal: "Where we agree, Republicans must be the president's strongest partners"
Jindal: "Don't let anyone tell you that we cannot recover"
(CNN) -- Tapped by the Republican party to deliver the GOP's response to President Barack Obama's congressional address Tuesday night, Louisiana Gov. Bobby Jindal took on the massive stimulus package and big government -- and pledged that his party would regain the nation's trust. Louisiana Gov. 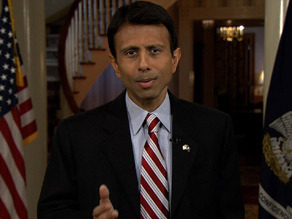 Bobby Jindal gives the GOP response to President Obama's address Tuesday. "In the end, it comes down to an honest and fundamental disagreement about the proper role of government," Jindal said. "We oppose the national Democratic view that says the way to strengthen our country is to increase dependence on government. We believe the way to strengthen our country is to restrain spending in Washington, to empower individuals and small businesses to grow our economy and create jobs. "In recent years, these distinctions in philosophy became less clear -- our party got away from its principles. Tonight, on behalf of our leaders in Congress and my fellow Republican governors, I say this: Our party is determined to regain your trust," Jindal said. Obama, in his first speech to a joint session of Congress, largely focused on the $787 stimulus and thanked Congress for passing his economic recovery package, which he said will save or create 3.5 million jobs and give a tax cut to 95 percent of working families. Obama's address came two days before he plans to submit his budget summary to Congress. Jindal, the nation's first Indian-American governor, opened his remarks by calling the speech by the nation's first African-American president "a great moment in the history of our republic." He drew comparisons between the president's background and his own. "Regardless of party, all Americans are moved by the president's personal story -- the son of an American mother and a Kenyan father, who grew up to become leader of the free world," Jindal said. "Like the president's father, my own parents came to this country from a distant land." But the governor quickly moved on to the economy. Jindal has been a vocal critic of the stimulus package, highlighting what he considers waste at a White House meeting with governors on Monday and in his speech Tuesday. He noted $300 million to buy new government cars, $8 billion for high-speed rail projects and $140 million "for something called 'volcano monitoring.' "
Jindal, seen as a possible contender for the 2012 GOP presidential nomination, has announced plans to reject $100 million of stimulus funding for his state, saying it would require Louisiana to change its unemployment laws. Several other governors have expressed similar concerns. "Democratic leaders say their legislation will grow the economy," Jindal said. "What it will do is grow the government, increase our taxes down the line, and saddle future generations with debt. Jindal pushed back on the notion of big government, saying, "Today in Washington, some are promising that [big government] will rescue us from the economic storms raging all around us. "Those of us who lived through Hurricane Katrina -- we have our doubts." However, Republicans are ready to work with the new president, Jindal said. "So where we agree, Republicans must be the president's strongest partners," he said. "And where we disagree, Republicans have a responsibility to be candid and offer better ideas for a path forward."